Oliver Stone’s latest film Snowden is easily one of the most important movies of the year. Whether or not it becomes a classic like Born on the Fourth of July or JFK remains to be said but what is undeniable is that this is a movie that speaks to the zeitgeist of right here and now. 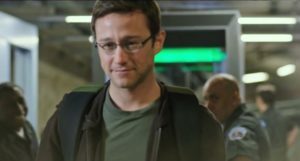 Joseph Gordon-Levitt plays Edward Snowden to perfect. From his speech patterns to his facial ticks Levitt has mastered the art of being a cinematic chameleon. The movie more or less gives an inside look into the days Snowden was stuck inside a Hong Kong hotel in 2013 leading up to his leaking the information out to the media. Much of the real life events of the film can be seen on the fantastic documentary Citizenfour and manages to make the documentary filmmakers real characters unto themselves. Joseph Gordon-Levitt gives one of his most compelling performances to date as Edward Snowden. As Snowden tells his story, both on and off camera, the audience goes with him on his journey through flashbacks. Snowden, a born conservative with tremendous respect for his country, finds himself working his way up the intelligence ladder and further down the rabbit hole. The more jobs he takes with the CIA and the NSA the more information he uncovers about the inner workings of the U.S. government that he wishes he hadn’t. His inner struggle is at the heart of the story. Thankfully he’s not alone on the journey. His on again, off again girlfriend Lindsay (Shailene Woodley) loves him enough to stand by him even as his job takes him around the world and in difficult moral quandaries. She operates as well as she can in the dark since most of his work remains classified. But as the stakes get higher their romance becomes a key driving force in Snowden’s evolution. How much of that is fact and how much of that is fiction the audience will never know, but it works for the movie. In the end the film is about informing people. It is more involving than a simple documentary because the audience gains not only more context to the events that are unfolding, but a real person to follow on a journey. Stone wastes no time diving into the murky waters of the intelligence community and, for the most part, doesn’t pull any punches with the jargon. If you’re looking for a comforting movie, this isn’t it. If anything this film will make you question just about everything that you’ve done on the internet in the past decade. If it has accomplished that then it has done its job.